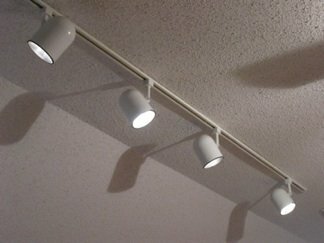 Adequate overhead model railroad lighting is an extremely important necessity for properly displaying your model train layout. If your room is dingy and dark, you and your visitors won’t really be able to appreciate all the hard work you’ve put in to making your railroad a work of operational art. A brightly lit room with evenly distributed light will enhance the mood of the room and provide a better environment for you to work on your trains. That said, I would be sure that your overhead lighting also has a dimmer switch so that you can change the mood and effect of the lighting at will. You will want to be able to simulate dusk or even nighttime occasionally. Many people like to use fluorescent model railroad lighting overhead. The only problem is that those types of lights are not dimmable. You could still use the fluorescent lights when you want full, bright diffuse light, but when you want to simulate dusk, you will have to turn off those lights and turn on a second set of lights that are dimmable. Or just use incandescent lights all around, which is my preference. I like track incandescent model railroad lighting myself for overhead lights (e.g., Thomas Lighting - TR302-8 ), which gives the most versatility in positioning and brightness or dimness and helps to enhance certain scenes when I want that to happen. You can always add more lights to your track if you need to as long as you don’t overload the circuit for the room. They should be distributed and spaced fairly evenly. If you’re photographing a certain scene and you want it to look like sunlight is the source of light, you will have to use a Spotlight Floor Lamp with a 150 or 200-watt (or higher) bulb and turn the overhead lights off to avoid conflicting shadows. Turn the flash off on your camera, mount the camera on a tripod, and use the delay setting so you won’t be touching the camera when it takes the picture. This is a nice effect to use on a layout for certain occasions or even for ambient room lighting if you have your model railroad located in the living area of your home. You will need to purchase rope lights (string lights encased in a plastic covering so that none of the lights are exposed) containing orange or red-orange light bulbs (e.g., 25Ft Rope Lights; Brilliant Amber LED Rope Light Kit ; 1.0 ). These can mostly be found in Halloween stores or online. Before you use the rope light for your layout make sure they do not generate enough heat to burn or overheat the surrounding scenery. Test them before installing them on the layout by leaving them turned on for 1-2 hours and checking the temperature. If you can’t hold the rope light in your hand or if there is any concern about it being too hot, don’t use it. Use strips of tin foil shaped as a half cylinder in which to lay the lights on the back of the layout next to the backdrop. These should be hidden behind your scenery and not visible from the front of the layout. If you have mountains that climb onto the backdrop, you will have to create a space on the backside of the mountain near the top, between the backdrop and the mountain on which to lay the rope light. The light should appear to be coming from the back of the mountain. Attach the rope light to a dimmer switch so you have control over the brightness and adjust it to your liking. Another interesting method of creating a sunset glow behind your mountains or cityscape is the use of electroluminescent cable lighting. The EL cable can be placed between the back of your scenery and the backdrop similar to that described above for rope lighting. Even if you have a flat layout surface, you could still create a depressed space in the back of the layout along the edge of the backdrop, which would be easy if you have a foam layout surface. Electroluminescence can also be used for a wide variety of other model railroad lighting applications. This has been described in the page on Model Railroad Buildings. I would only add here that rather than use all white lights for your structures, it would be more realistic to use yellow or amber bulbs to represent the incandescent lighting that most people use in houses and small stores. This is another aspect of scenic model railroad lighting where you can really enhance the realism of your buildings if you use street lamps that actually work. You can also use neon or other types of sign lighting to put on your buildings and to light up billboards. Then, when you dim your overhead lights, your cities and towns will come alive. These are all available for purchase through online catalogs such as Walthers. For more information on special lighting effects, fire effects, and the use of other electonics applications for your layout, you may want to visit the Special FX section. From "Model Railroad Lighting" to "Homepage"
Also see page on "Train Room and Lighting"